KawaiiPunk - Kawaii Mascot Blog: Edzemo. Monster Mayhem! With only five days left until Halloween I’m sure a lot of you will be busy planning your outfits and costumes for the upcoming celebrations. After all, what’s the point of having Halloween if you don’t get dressed up to enjoy it? Which got me thinking… if dressing up in ghoulish garb is so much fun, why should we restrict ourselves to doing it only once a year? Why don’t we do it all the time? Welcome to the cute, cool and creepy world of Edzemo. The Edzemo RedBubble shop is living proof that monsters aren’t just for Halloween. 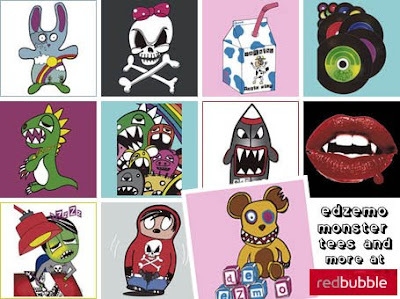 Its colourful selection of Rainbow Monsters, Crazy Bears and Wild Monkeys are the perfect combination of slick styles and sartorial spookiness! Just the thing for people who like their pumpkins all the year round, if you know what I mean!